LEGO is already a license to print money, what with massively successful toys, videogames, themeparks and films. However, that is not enough for the House of Plastic and LEGO Dimensions has been created to grab a slice of that beautiful Skylander/Disney Infinity Pie. How can they compete? With IPs like Back to the Future. 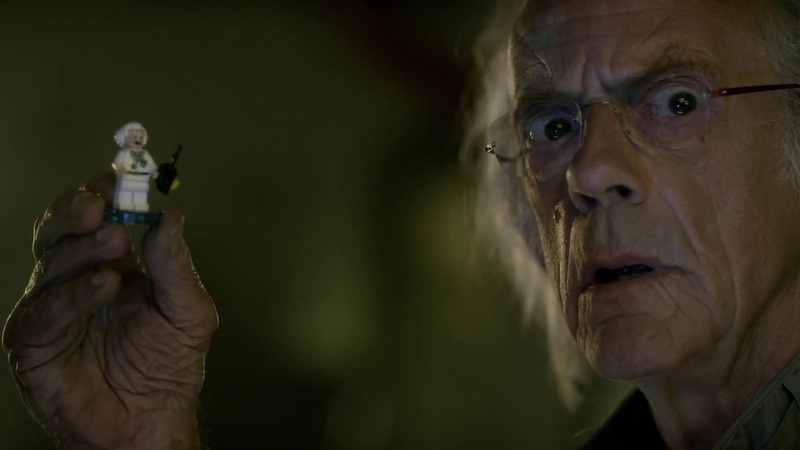 The new trailer for Dimensions stars Christopher Lloyd reprising his role of Doc Brown only to receive a strange box in the post. What is this mysterious portal and were will it lead? In a new video featuring actor Christopher Lloyd reprising his famous role as Doc Brown from the Back to the Future films, Warner Bros. Interactive Entertainment revealed today gameplay featuring even more beloved characters coming to LEGO Dimensions, the upcoming entertainment experience that merges physical LEGO brick building with interactive console gameplay. In addition to LEGO Batman, LEGO Gandalf and Wyldstyle, the three minifigure heroes used to start the experience, LEGO Dimensions will allow gamers to customize their experience post-launch and throughout the first half of 2016 with additional packs from the previously announced brands, including: DC Comics Team Pack featuring LEGO Joker and LEGO Harley Quinn minifigures, three additional DC Comics Fun Packs featuring LEGO Superman, LEGO Aquaman and LEGO Bane minifigures, Back to the Future Fun Pack with LEGO Doc Brown minifigure and two additional LEGO Ninjago Fun Packs with Sensei Wu and Lloyd minifigures. LEGO Dimensions is out on all the major consoles on 27th September and will have local 2 player co-op across many different LEGO based worlds.